I was born and raised in Little Village, and I continue to live here. When I went off to college in 2006, I was the first in my family and, as far as I know, the first on my block to do that, so I was very, very homesick in New York. I was always just thinking about home and missing my family and my neighborhood, so I would google “Little Village”, hoping to find news and just good stuff to read about my home, and I realized that there really wasn’t much out there, you know. There were always articles about shootings, immigration raids, all this negative stuff, and I felt like we needed to balance that out a bit. I realized there was a sizable number of people from the neighborhood who were on Facebook and I figured I should start a little group to bring people together and just talk about their block, their school, or anything about Little Village. Back when we first started, the media wasn’t very responsive to hyperlocal issues. They wouldn’t do business profiles or cover the good work of nonprofit organizations or churches, so we started featuring small businesses, young people doing positive graffiti or playing basketball, just people in their element doing positive things. People were very responsive. There’s always been a lot of positive feedback, reminiscences, and people just talking about their community. I had grown up with the media always portraying us as kind of a bad neighborhood, but once I left I realized just how much I missed it. There’s a sense of family everywhere you go, and the food is as authentic as it’s going to get when it comes to Mexican food—you have recipes that our mothers and grandmothers, who immigrated just one or two generations ago, created. We have block clubs—I mean, I know they’re everywhere in the city, but here they’re extremely well-organized. They actually get together to plan and to entertain. Especially in the summer, every single Saturday there are block parties, run by families. I believe we have the strongest work ethic in the city of Chicago. Maybe that’s boastful, but I believe that’s the case. I think that shows through in someone like the paletero, and all the street vendors that you see on 26th Street and elsewhere in Little Village. I think they really set the tone for the street vending movement that’s emerging in Chicago. The taco trucks and street vending trucks that are starting to get organized, I think that really began with the paleteros and the other vendors in places like Little Village. I think the media has caught on now, after a long time. The community has gotten really quick about breaking stories about positive things happening, and the media will follow up on those stories. A lot of the news that we learn about is through the Facebook page. People send us their news. It’s a very collaborative process—unintentionally, but that’s how it works. Jackie Serrato is an independent journalist and lifelong Little Village resident. She started the “La Villita, Chicago” group on Facebook, which now has more than 100,000 members. 24th St. & S. California Ave. Friday–Sunday, pending good weather, from early in the afternoon until after midnight. 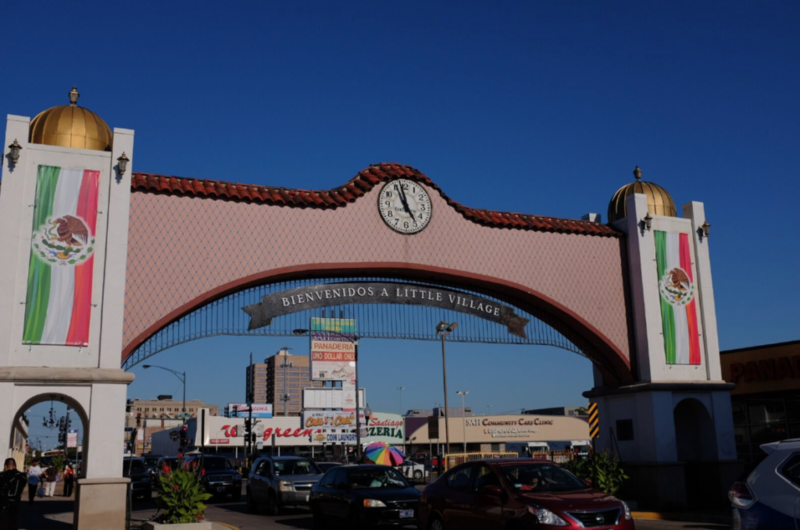 Walking west along 26th Street, it’s not surprising to see strings of taquerias, paleta carts, and various stands selling balloons, toys, and flags painted red, white, and green. But when you encounter OK Corral, one of the largest Western wear stores in Little Village, you may raise an eyebrow. Although the city of Chicago may seem like an odd market for OK Corral’s inventory of authentic Mexican boots, belts, hats, and saddles, the sales clerk assured me that residents of Little Village and surrounding neighborhoods are eagerly snatching these luxury items up. Many of the items for sale are hand-tooled leatherwork, imported directly from craftsmen in Mexico, and list for prices that would appear as four dollar signs on Yelp. Some of the piteado belts sold there take more than a month to create, and are embroidered with silver thread. Also on display are decorative saddles for Charro riders and their horses, whose “dancing” talents are featured each year in the neighborhood’s annual celebration of Mexican culture and history. OK Corral VIP Western Wear, 3300 W. 26th St. Open daily, 11am–8pm. (773) 703-3310. Piotrowski Silver Skate Plaza, W. 31st St. & S. Kildare Ave. Daily, 6am–11pm.